RusVinyl PVC production facility, ranking among Russia’s largest petrochemical investment projects, was inaugurated today. Kstovo (Nizhny Novgorod Region), 19 September 2014. 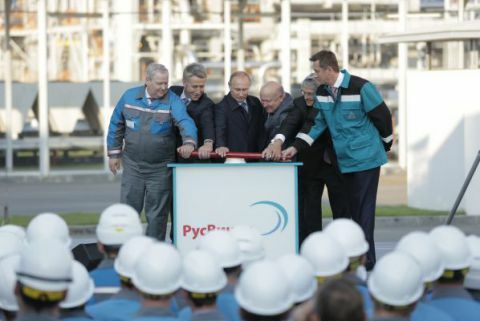 The RusVinyl polyvinyl chloride (PVC) production facility in Kstovo (Nizhny Novgorod Region), ranking among Russia’s largest petrochemical investment projects, was inaugurated today. Vladimir Putin, the Russian President, attended the grand opening ceremony, along with Alex van Meeuwen, Belgian Ambassador to Russia, Valery Shantsev, Governor of Nizhny Novgorod Region, Leonid Mikhelson, Chairman of SIBUR’s Board of Directors, Alexander Dyukov, Deputy Chairman of SIBUR’s Board of Directors, Jacques van Rijckevorsel, Chairman of the Board of SolVin, Dmitry Konov, CEO of SIBUR, and Guenther Nadolny, CEO of RusVinyl. RusVinyl is a joint venture between SIBUR, Russia's leading gas processing and petrochemical company, and SolVin, and was created to construct a new PVC production site that could meet a significant part of domestic demand. RusVinyl is one of the largest PVC producers in Russia with an annual production capacity of 330 kt of PVC and 225 kt of caustic soda. It will benefit from the nearby supply of ethylene, a key raw material for PVC, from SIBUR-Kstovo's steam cracker, expanded to 360 kt especially for the RusVinyl. Salt, the other feedstock for PVC production, will be provided from Belarus and from the Astrakhan Region of Russia. In 2013, PVC consumption in Russia exceeded 1 mt, of which only 0.6 mt was produced locally. RusVinyl will provide its top-quality products to the undersupplied Russian market and is aimed at the further development of downstream operations and consumption of petrochemicals. “SolVin is proud to have successfully completed this project, which is among its biggest industrial achievements ever. SolVin’s experts from across the globe pulled together with SIBUR’s team made this the most modern and most environmental friendly, fully-integrated PVC production plant in the world,” said Jacques van Rijckevorsel, Chairman of the Board of SolVin. This greenfield project, with an investment exceeding RUB 60 bn (€ 1.4 bn), entirely complies with Russia's strictest environmental regulations. Thanks to cutting-edge vinyl technology, fully automated production and state-of-the-art equipment, the facility's environmental footprint is marginal. Each section of the facility has multi-tier safety systems. An advanced membrane method prevents hazardous substances from being formed during electrolysis. Finally, RusVinyl uses a patented technology that makes electrolysis completely waste-free. RusVinyl’s process flow scheme consists of three phases. During the first production stage, salt is electrolysed into chlorine and caustic soda, a marketable commodity, and shipped to customers. The second stage is the production of vinyl chloride monomer (VCM) under high temperature. And the third stage uses a catalyst to turn VCM into two kinds of PVC – emulsion (30 ktpa) and suspension (300 ktpa), which are shipped to buyers in bulk, big bags of 1 t and bags of 25 kg by road and rail. PVC is the second most wide-spread plastic in the world after polyethylene. Areas of use: construction and infrastructure (pipes, window frames, flooring), the automotive industry (seats, interior trim), electrical equipment (cables), furniture, packaging, consumer products (tableware, toys), footwear, clothes (artificial leather), sports equipment, etc. Polyvinyl chloride is an inert polymer, safe for humans and the environment. The service life of goods made of PVC is up to 50 years. They are easily recyclable. Caustic soda, a by-product of PVC production, is widely used in agricultural and chemical industries, aluminum production and the paper & pulp industry. SolVin is jointly owned by Solvay (75%) and BASF (25%). SolVin owns 50% of RusVinyl through SolVin Holding Nederland B.V. which is held by SolVin (79%) and the European Bank for Reconstruction and Development (EBRD) (21%). The project’s investment was funded in part by the RusVinyl JV partners SolVin and SIBUR, as well as a € 750 m long-term project financing from a bank consortium. The bank consortium consists of Sberbank and EBRD for a RUB tranche of € 300 million equivalent and ECA-covered international banks (HSBC, BNP Paribas and ING) for a EUR tranche of € 450 m). ECA stands for Export Credit Agencies.